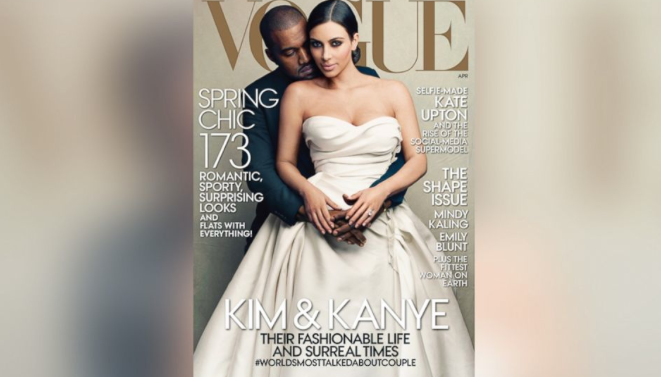 Vogue surprised it's faithful subscribers when they decided to place Mr. and (future) Mrs. West on the cover of their April issue. The reactions were various: some readers loved the display of the modern luxury of life, while others wished to unsubscribe from the magazine and even went as far to start #BoycottVogue as a trending topic on Twitter. Despite the rumors that Kanye begged Anna Wintour to place them on the cover, we all realize her reasons for featuring the undaunted couple are more than reasonable. Wintour obviously not only understands the tradition of the label she works for—she has possessed her position for all this time after all—but Wintour also recognizes when certain traditions shall be paused for more modern occasions. Kim and Kanye both realize their limits when pushing aside the expectations of society, seeing as they choose to ignore them. Whether you like the Wests or not, you must commend them on demanding the public's attention--good and bad--while somehow always knowing how to handle the limelight effortlessly every time it comes their way. The editorial overall was stunning, and besides, who could resist seeing baby North in her plump and splendor!